On September 24, 2018, the Journal of Interprofessional Care published a new article by the Interprofessional Professionalism Collaborative (IPC) on "The Intersection of Professionalism and Interprofessional Care: Development and Initial Testing of the Interprofessional Professionalism Assessment." The authors discuss a new psychometrically sound assessment instrument used to measure observable behaviors of healthcare professionals in-training that demonstrate professionalism and collaboration, which are essential to person-centered care. 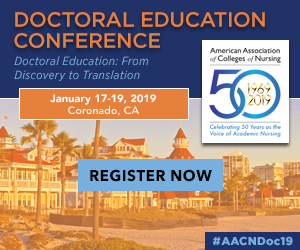 Kathy McGuinn, AACN's Director of Interprofessional Education and Practice Partnerships, co-authored the article and represents AACN in IPC's work. In the September-October issue of Nurse Educator, Dr. Betty Ferrell and colleagues take an in-depth look at "An Innovative End-of-Life Nursing Education Consortium [ELNEC] Curriculum That Prepares Nursing Students to Provide Primary Palliative Care." In this article, the authors describe the development and implementation of an online nursing curriculum that prepares prelicensure students to provide high-quality nursing care to patients with serious illness and at the end of life. Pam Malloy, AACN's ELNEC Project Director and Co-Investigator, coauthored the new article. Johnson & Johnson published a new Notes on Nursing podcast featuring an interview with a neo-natal cardiac nurse who worked to implement newborn screening policies for critical congenital heart disease in hospitals across the world. Listen here and learn more about her story. Mark your calendar for November 14 at 2 PM ET for the next Inside Higher Ed podcast on Graduate and Professional Education: An Ever-Changing Environment. Participants will gain insights on trends such as the impact of graduate training in research and teaching, U.S. News & World Report ranking considerations, and more. Individuals unable to attend in real-time are still encouraged to register, as all registrants will receive a recording of the webcast and a copy of the presentation. Inside this edition of Washington Weekly: Read AACN's midterm elections recap; thank you to 600 AACN members for participating in Nursing Voices, Nursing Votes; students have the opportunity to learn effective advocacy during Health Professions Week; and the 2019 Health Insurance Marketplace is open through December 15. 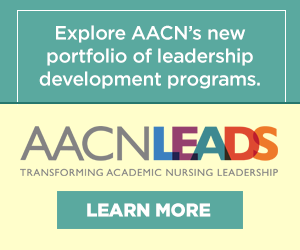 Submit Your News to AACN! AACN Members and related stakeholders are encouraged to submit articles of interest, research awards and opportunities, member school announcements, new partnerships or grant-funded initiatives, and resources, to the AACN for inclusion in the newsletter, according to the following guidelines. Each section will be limited to one article per member school. If more than one is submitted, AACN staff will determine which will be published. We do not advertise university awards and events, continuing education programs, products for sale and other items that may imply endorsement or support one member school over another. Submissions must be received Monday at 12:00 pm (EST) in order to appear in that week's featured section. Send your article via email to Bill O'Connor, AACN's Director of Publications at boconnor@aacnnursing.org.